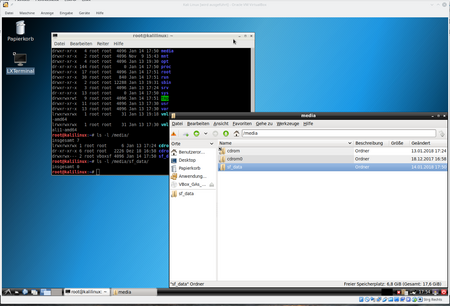 This section explains how to set up a shared directory for VirtualBox guest Kali Linux with its host system. To do this, select your Kali Linux VM instance in the VirtualBox Manager and open the "Shared Folders" menu under "Change" in Settings. In the right pane, there is a Plus folder icon that opens a pop-up window to add shared folders. Here you select the desired folder and give it a new name. 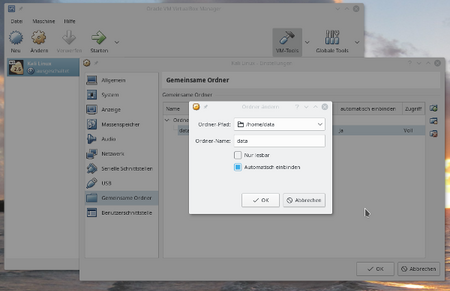 Activate the checkboxes for "Auto mount" and close the process each time you confirm with "OK". As you can see in the figure, the shared folder is now below the media directory. If you want, you can bookmark the file manager for faster access.